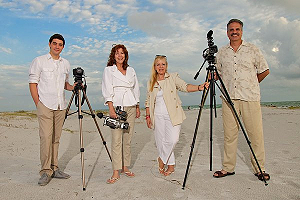 Visions Unlimited Video Productions of Sarasota, Florida is a multi-media video production company that has created extraordinary videos for over 13 years. We capture all the action and emotion of the biggest day of your life using 3-chip digital broadcast TV cameras. Only a professional has the equipment, the experience, and the talent to create a beautiful wedding video. Take away some of the worry; let a professional handle your videography. Videography is a true art form. Creating a truly unique wedding video is more than rolling the camera. Only a professional has the equipment, experience, and talent to capture your wedding memories without hardly being seen. Next to your Photographs, your Wedding Video will be your most valuable wedding keepsake.